German-Jewish couple escape the Holocaust but not their accursed heritage. After a 35-year hiatus from fiction (she authored a popular cookbook series, Kitchen Wisdom, etc. ), Arkin (The Dorp, 1969) has crafted a small gem of a second novel. Hedwig and Berti, married first cousins, flee to Britain just before their blue-blooded Berlin family is decimated by the Nazi genocide. The two descend on their cousin Harry in his small London flat. Hedwig, a statuesque blonde Valkyrie type, is in denial about what is going on in her homeland. Berti, a diminutive self-effacing guy, just wants to take care of small animals as a veterinary assistant, despite overtures from his boss’s wife. 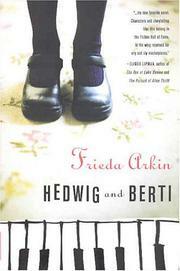 Hedwig gives birth to Gerda, an odd-looking child who’s taken at first for a changeling. Preternaturally attuned to sound, Gerda claws her way to piano lessons, a master teacher, and a concert career. The couple’s odyssey continues to the US, where Berti finally finds love and respect as a night clerk in a Kansas bordello, and Hedwig becomes the domestic hausfrau goddess of a frat house. Scandal scuttles Gerda’s performing career after she punishes a recalcitrant pupil in a way that would do the character in Elfriede Jelinek’s The Piano Teacher proud. Gerda joins her parents in the US but can’t shake the self-hatred that stiffens her fingers and drives away would-be mentors. Hedwig’s older brother, Bruno, her reluctant host in America, was exiled years before after his mother died under mysterious circumstances (poisoned? ), followed by his father (suicide? ), leaving Hedwig to be raised by her imperious health-nut grandfather, the wealthy owner of a wurst factory. Bruno’s airing of dark family secrets staunches Gerda’s pain, but only until her mother’s more shocking confession reopens the wound. Arkin depicts these damaged characters, and their territorial and emotional displacement, with unflinching honesty and rueful insight. The language, as pitch-perfect as Gerda’s ear, shifts seamlessly from British to American to German-accented ESL. A bravura encore worth the wait.